After all the partying we decided to take it easy and do some sight-seeing. 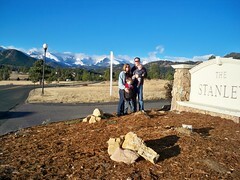 Here we are by the Stanley hotel sign. The mountains were beautiful and the weather couldn't have been better. Max and Jered climbed a rocky area that put them higher than the hotel roof line. Max and I went on the Stanley Hotel Ghost tour, which was an very interesting history of the hotel. Great pics of the boys and the scenery. Looks like fun.